That is seriously the name of a cookbook that my sister gave my not-very-cook-worthy husband a few years back. I’m not sure why, but Rick resurrected the Man/Can/Plan last night…. and gave me a night off cooking. Whew. The book is quite humorous… it is like a child’s board book with wipe-off pages just in case the Man and the Can go awry. It is also funny because it shows pictures of everything you need…. PICTURES… so you don’t have to read. But there are directions… saying things like “manhandle the Fritos to crush them” and “dump everything in a skillet” and “nuke on high” and “slop an equal amount” and “mash the ham” and on and on. The subtitle of the cookbook is “50 Great Guy Meals Even YOU Can Make!” Rick was so proud of himself and his can and the plan that he took a picture. Here it is for your viewing pleasure. Yes, that little orange caption says “Avoid a Gas Crisis” and describes how to add liquid Beano to the beans (tactful? )…… what next? 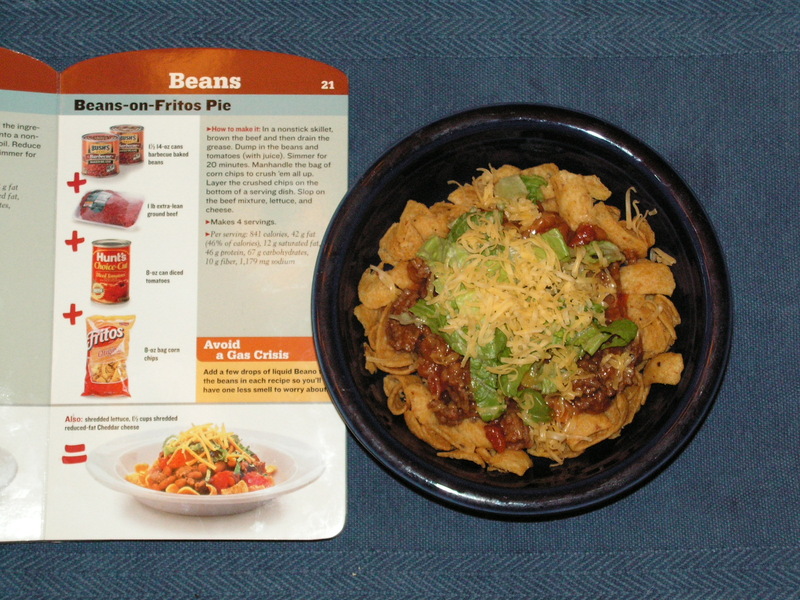 It actually tasted pretty good if you like pork-n-beans and Fritos… but the caloric intake for one serving was 841! With a mere 42 g. of FAT. There is a whole section at the back using beer. Rick was rattling off ingredients for me to pick up at the store and I refused even to write the word beer on my list, fearing that a pastor’s wife would find my list in my purse. Nada on the Jose Cuervo, Big Boy. Sitck to the Fritos section. There is also a Spaghettio’s SECTION! God save us. Three cheers for men who think they can cook! Poo Bah! Poo Bah! Poo Bah!